You provide the script and choose the voice over. We organise and manage the process, negotiating fair and consistent rates with our professional voice overs. You do not have to scour the web seeking countless demos, prices or references; we have done the work for you. Many voice over services charge voice overs a fee to upload demos and audition for jobs. Voice actors can pay to join and start auditioning regardless of ability, resulting in a myriad of voice over experience and inconsistent audio quality. We do not charge voice overs to join and we assess the quality of recordings before a voice over can join our roster. Editing and production is done in-house and we manage all bookings. The result is consistent audio quality and better service. IVR, on hold, out of hours, messages with professional voice-overs and PRS free music. Professional voices for your business needs. Priced to suit a variety of budgets. Custom DJ intros, custom DJ drops, radio imaging, radio sweepers. Affordable voice over recording and production of your audiobook. Intros for live shows, TV, theatre, stage show, ceremony, wedding or conference. Voice overs for commercials and promotions that will be broadcast. Clear narration for products, toys, games, e-learning and educational projects. Engaging and expressive voices for documentaries, films and TV. Professional narrators for your Podcast, videocast or vlog. Looking for a different service? If it's not covered here, we may still be able to help. Just contact us. How much do tracks cost? We operate a credit system that enables you to buy just the credits you need or you can buy more to get a generous discount. Credits you buy never expire, you can use them anytime. The amount of credits needed varies depending on the length of the track. To find out how many credits you need and how much it will cost simply click the "License Now" button in the search results. Seeing How Much it is? The screen shot below shows an example of the cost information displayed when the "License Now" is clicked from the search results. 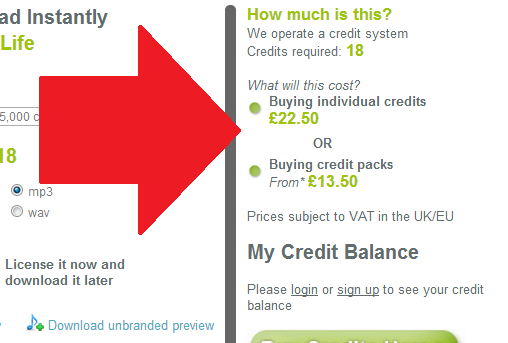 See our 'Buy Download Credits' page for full credit price details and discounts. 'My Lists' enables you to create and organise playlists of music tracks and sound effects. The lists you create will be saved in your account area and you can email it to yourself, your colleague or your client. What can this be licensed for? This is an overview of our music / effects uses. The licensee can reuse in multiple projects subject to our license terms. Use on a physical medium i.e. DVD, CDROM etc. up to 5000 copies. Video production for the web including sites like YouTube or your/company’s website etc. Includes use on videos monetized by adverts. Student films and festival films. For more than 1,000,000 copies please get in touch for a custom quote. These license options include the same uses covered in the standard license but extend its usage to include regional/national or worldwide TV and Radio advertising campaigns. Usage on local and independent stations is covered by our standard license. These license options cover usage in large scale theatrical or cinematic productions. If your project is a local / small production our standard license will suffice. Please select this Extended license to cover usage by blue chip / household brands. This license option allows for global, ongoing use on all known platforms with a single license fee. Not sure? On a Budget? If you are unsure, have a requirement not covered here, a limited budget or special requirement please get in touch. For additional information, see our Royalty Free Music Help. You need to buy some credits to purchase this. Click Buy Credits to do this. You can not resell or give the music away as music only. It must be combined with something, for example, a video, marketing message or voice over. 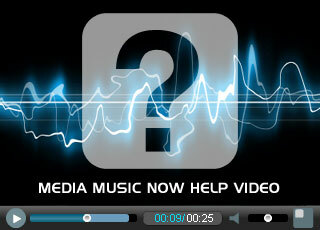 Video production for the web including sites like YouTube* or your/company’s website etc.